This report is a wrap-up of the test shoot conducted at South Creek Flats, Idaho. The intent of the test was to confirm the ballistic performance of the 419 gr. bullet as well as long-range accuracy of the gun system. Additional data was collected as to the shoot ability of the platform and recommended changes. Grouping ability at ranges to super-sonic minimum velocity. Ammunition sensitivity to temperature changes and shipping conditions. Fire control systems capability to support the gun platform. Gun system ergonomic and shoot ability features. Prior to doing the shoot in Idaho, I did a preliminary ballistics prediction of the potential for the .408 CheyTac cartridge using the 419 gr. bullet from Lost River Ballistic Technologies. The entire performance of the bullet was based on a predicted Ballistic Co-efficient of .900 at a muzzle velocity of 2900 fps. I prepared a table of elevation settings and windage corrections using SOE methods and techniques for long range shooting. It is important to note that virtually every bullet’s ballistic co-efficient value degrades as the bullet flies downrange. Instruments were available for determining Barometric Pressure, Air Temperature, and Ammunition Temperature and for monitoring the barrel temperature. The altitude of the site is 5300′ above sea level. Barometric Pressure ranged from 26.15 In. Hg. To 26.85 In. Hg. This required an hour by hour recalculation of elevation settings. Air Temperature Ranged from 40° F to 65° F throughout the test. Ammunition Temperature was maintained at 70° F and monitored by NECO temperature strips. Barrel temperature for the long range shots over 1700 meters was monitored and shots were fired only when barrel temperatures were the same shot to shot. We arrived early enough on Monday 16, April to get some range time in. We took the opportunity to coordinate the gun/optics to the data set that we prepared. Initial zero took place at 100 yards. The elevation on the Leupold & Stevens Mark IV M-1 scope was up 30 minutes of angle from the bottom of travel. This is due to the 1 degree base that is on the prototype gun. This low angle was to plague us later on in the longer range work. My initial observations on the gun were that the bipod legs were too tall for good prone work. I compensated by digging the bipod legs into the ground about 2.5 inches. In doing this, I eliminated the need for the monopod as I felt that the monopod is too unstable for good long range shooting. A heavy leather shooting glove under the toe of the rifle served to manipulate the tail of the gun. Initial impressions were that with the modifications to the gun, it is a stable, though a tall long range platform. We quickly took the gun to 800 yards on Day 1. The predicted data was accurate to within .25 minutes of angle for elevation and windage. We began operations on Day 2 at the 1000 yard line. I indexed a specified 24.75 Minutes of Angle on the sight and shot a group of three rounds. The group was sub-minute and required and additional 1/4 MOA of elevation to center the group. Due to the initial success of the predicted data, we decided to skip 1100 and 1200 yards and shoot at 1300 yards. At 1300 yards, I indexed a predicted 34.75 MOA on the sight. The group was again sub-MOA and required and additional 1/4 MOA to center the group for elevation. At that point, it began to become evident that the ballistic co-efficient of .903 was NOT bleeding down at a decay rate that is consistent with other projectiles. All elevation settings were based on a straight .903 BC with NO decay rate. We began range operations at 1700 yards. An initial elevation setting of 50.50 MOA was indexed. 3 rounds were fired into a sub-MOA group. The weather was barely holding and we decided to push onto 1900 yards. The winds during this shooting session were from a low of 0 mph to a high of 7 mph and from directions of 6 o’clock to the gun-target line to a left to right condition from 10 o’clock to the gun-target line. See below photos of the target at 1900 yards. The afternoon weather was too extreme for long range shooting so we returned to Warren Jensen’s shop to conduct velocity tests on the indoor range. Details of this test will follow the long range summary. The range on this day was swung approximately 80 degrees to the East. It was agreed that the dominating winds were across the original range for the majority of the time. We swung the range and used the Wild theodolite to set the target at a range of 2300 yards. This was the first range at which we encountered mechanical difficulties with the gun system. The problem was with the optics, not the rifle. At 2300 yards the rounds were constantly high and to the right. We corrected mathematically what should have been the data to get rounds on the target. After numerous rounds were fired, we terminated the shoot to determine the problem. It was determined that we were at such an extreme elevation setting on the L&S scope that the erector cell inside of the scope tube was actually touching the inside surface of the tube. The scope base was out of alignment enough so that with 0 winds on the gun and the scope zeroed for windage, there was only 15 minutes of angle of windage available for right hand correction. There was 30 minutes for left hand correction. The winds from the left to the right at about 7 mph, which required a 6.5 MOA left correction. This crowded the erector cell against the inside of the tube and forced the shot group to carry to the right at the target. We were getting 1 to 1.5 minute of angle groups, but they were spotted off of the target in the dirt. Barometric Pressure: 25.65 In. Hg. The first three rounds out of the gun struck on the target with 1 MOA vertical dispersion and 1.6 MOA horizontal dispersion. Horizontal dispersion was due to winds near the maximum ordinate at 52′ above the eye – sight line. The calculated elevated setting of 83.50 MOA was correct. By this time, the winds across the range were starting to pick up, so we decided to shoot the 2400 yard range on the original North – South, gun – target line. The data for the 2400 yard shot was calculated and an elevation setting of 91.00 MOA was calculated. These shots were high and dropping down to 88.50 MOA made an adjustment. This was attributed to a combination of tailwinds and a drop in the barometric pressure. A small air temperature rise as well as ammunition temp rise factored into the change. 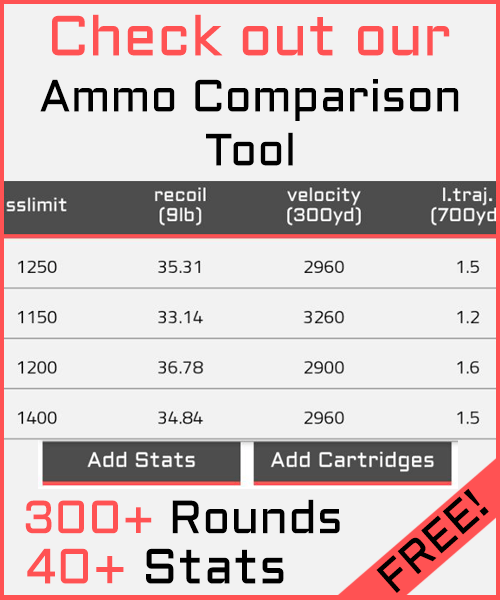 At this point, the original ballistic co-efficient of .903 appeared to be holding true. Later, when I recomputed the true ballistic co-efficient based on the 88.50 MOA setting, the true BC was calculated to .91413 at Sea Level. The BC had actually stepped up in value. The weather conditions by this point had deteriorated badly and we terminated the test at 2400 yards. We tested the ammunition’s sensitivity to 4 different variables. Results indicate that the ammunition is more sensitive to colder temperatures, but far less than current military ammunition. An average loss of only 65 fps was determined. Because of the ballistic performance of the 419 gr. bullet, this change in velocity accounts for only .50 MOA of elevation change. Vertical impact changes due to hot ammunition are considered insignificant. Velocity changes due to the positioning of the powder indicate an insignificant change in the muzzle velocity. The fire control system for the .408 CheyTac rifle for this test was the Leupold & Stevens Mark IV, M-1 in 16x. This scope is perhaps the most respected 1/4 Minute of Angle telescopic sight in the sniping community. The history of the scope goes back to the early 1980s. It is combat proven in all the US services and with foreign armies around the world. It is considered the standard by which others are measured. It is important to establish the system setup as first presented on Day 1 of the tests to understand the problems encountered at long range. Center of Elevation Travel is at 75 Minutes of Angle. The relation of the scope base angle (60 Minutes) to the center of elevation travel (75 Minutes) is critical. To obtain the total range of travel available on the L&S scope (140 MOA) it is critical that the angle of the scope base be optimized so that there are less than 10 MOA of elevation travel left below a 100 yard zero setting. This would leave approximately 130.00 Minutes of Angle of elevation travel. While is true that you would not use all of that elevation travel, you will need all of the windage capability of the scope for long range work. The windage must be centered correctly on the scope and this is based on whether the base on the gun is parallel to the bore. If our case, during this test, the scope base was approximately 17 MOA out of alignment with the bore. This resulted in a condition where the windage was already 17 MOA to the left, leaving only 8 MOA left for windage. It is not that simple however. As the shooter brings the elevation setting up above 85.00 Minutes of Angle under the above windage condition, the erector cell began to touch off on the inside of the scope tube body. This pushed the erector cell farther to the right. As the erector cell followed the inside circular shape of the tube, the shots were forced higher and to the right, making strikes impossible as you adjusted for windage. At that point, we stopped the test and regrouped at Warren’s shop to consider the options. As before described, we re-machined the base angle to pickup an additional 15 Minutes of Angle, as well as correcting the miss-alignment in the scope base by shimming the forward claw mount. A customer may specify a scope from several different options. These are listed with their optimum scope base angles based on the total elevation travel and their centers of elevation travel. The base angle would be optimized for the user based on the center of elevation travel. While it is true that you may NOT shoot the maximum elevation capability, there is an advantage to having remaining elevation. The farther away from the optical center of the lenses that you aim through, the more it is likely that the shooter will encounter optical distortion. This occurs when you look through the erector cell lenses into the outer edges of the objective lenses. This distortion is called “optical vignetting”. While not detectable with the naked eye, this distortion can result in the shot being fired at something other than the point of aim / impact. By having the maximum elevation setting that you may shoot near the center of travel of the elevation, you are shooting through the center of the lenses. For example, on the current sight system, the Mark IV M-1 16X, the center of elevation travel would be at 75 MOA. With a base angle of 75 MOA, and having an elevation setting of 88.50 MOA as was shot for the 2400 yard test, you would only be 10 MOA above the optical center of the lenses. This is a prime condition for long range shooting. While the extra elevation seems like a waste of capability, you are avoiding the possibility of optical vignetting and a potential missed shot. Following is a list of observed positives and negatives about the gun system itself. The cheek piece does not extend forward enough for a good stock weld during prone shooting. With the optical sight in the slot nearest the shooter and good eye relief, the cheek piece sets directly under the cheekbone of the shooter. While it is not uncomfortable, it does not lend to a good stock weld. This is very critical when having extreme elevation settings on the scope. At extreme elevation settings, the scope begins to “cat-eye” requiring super precise eye relief. Good cheek support is essential to establishing this critical eye relief. Solution: Extend the existing cheek piece 1.5″ to 2.0″ forward or develop an attaching extension. The pistol grip as provided is based on the design of the M-16 rifle. That angle is designed for combat patrolling and providing comfort to the soldier while carrying the rifle at low ready. The angle is too extreme to the rear for good prone shooting. Note that all the long range competition guns have a nearly vertical pistol grip. This was pointed out to Willi Wordman and a recommendation made as to a replacement at similar cost. The design is similar to the grip on the H&K PSG-1 rifle, being more vertical, with a palm swell and a palm rest platform, which is removable and adjustable. The rifle had a measured trigger pull of over 8 lbs. This is unacceptable for long range shooting as it is too easy to disturb the lay of the gun system while trying to get a clean release. The trigger weight was adjusted down to 3 lbs for the last day of the test. The resultant change yielded excellent trigger pull characteristics. The deep curve of the standard Remington trigger is extreme. When the trigger pull is heavy, that deep curve lowers the mechanical advantage that the shooter has. In that situation, any creep is accentuated and the impression is that of a heavier than measured trigger pull. Solution: Replace the Remington trigger with a Jewell or other match trigger with a longer length (vertical) and a more vertical profile. This shooter didn’t use the monopod as the gun was lowered as low as possible to obtain a stable shooting platform. The steel weight makes the gun excessively heavy and vibrates loose. Replace the entire assembly with a composite unit made of Delrin. Much more extensive testing of the armored aluminum should be conducted to determine the repeatability of zero when removing and reinstalling the optical sight. Damage to the base was noted from the claws on the scope ring during testing. Dings and dents will affect the zero repeatability of the system. It was observed that the base bearing surface was too thick. It was measured at .270″. The specification was for .250″. This resulted in the claw mounts on the rings not bearing correctly on the scope base. While this did not affect the accuracy of the gun, it contributed to the misalignment of optical sight (and non-centered windage). The over thickness also contributes to non-repeatability of the optical sight when removing and replacing the sight. Strongly recommend the use of steel in the scope base. The expansion rate of the aluminum (when heated) is different than the steel rings. The expansion rates of the base and rings should be the same to insure repeatability of the day sight. The weight gain is worth the insured repeatability. The cross slots for the ring mounts should be machined all the way to the end of the base. This allows for the use of ocular lens attached night vision devices such as the PVS-14 with the Monoloc device. Use a base angle optimized to the optical sight specified. The bipod in its current configuration and location has four major faults. It makes the overall system too heavy. The bipod, though already shortened from its original length, is too tall. This raises the shooter’s head and neck to an uncomfortable position and may promote physical injury. It is more favorable to bench rest shooting positions than prone tactical positions. The bipod is located to close too the rear of the gun. The bipod and its mounting method does NOT allow the gun system to be fired in any other method. (i.e. sling supported, resting on non-standard objects, such as a rucksack, tree branch etc.) Recommended Solution (s): The rifle was tested with an extended bipod attaching rod. While the rod was heavy, it greatly contributed to the overall stability of the system. When a bipod is located closer to the shoulder of the shooter than it is to the muzzle, the system becomes very susceptible to shooter induced disturbances. A little shake at the recoil pad makes for a lot of shake at the muzzle. Extreme range shooting demands a super-stable system. In a tactical environment, military snipers will be tired, shaking, hungry and quite often, in a state considerably less than that desired for the task at hand. At a minimum the bipod should be extended 13 – 15 inches. The gun system must be able to be fired from other than bipod supported positions. The system must be able to be fired from ALL conventional and unconventional shooting positions. These would include provisions for sling supported shooting, resting the system on branches, rocks, rucksacks, vertical suspension systems for use in helicopters, etc. This can be accomplished by using a tube system similar to that in use on the AR-15 rifle. These tubes comprise of a round aluminum tube integrated into the barrel nut. The tube is an attaching point for sling and rail devices so that lasers and other aids to aiming can be attached. It is a system rather than a mere support. The EDM Arms built, .408 CheyTac is an extremely capable extreme range interdiction rifle. To this shooters experience and knowledge, no other rifle / ammunition combination comes close to the accuracy and unknown distance potentials of the .408 CheyTac cartridge and weapon. With some fine tuning and further development of the heavy bullet as well as the light bullet configuration, the .408 CheyTac will dominate the extreme range sniping environment.